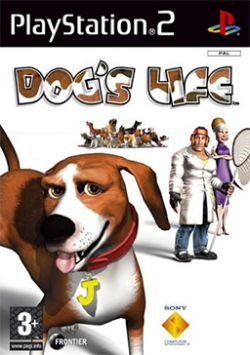 Game description: Dog's Life lets you take on the role of a hound--one that can play fetch, sniff out food, and chase chickens, among other things. Set in the rural Midwest United States countryside, the game starts you off on a journey that spans the country and takes you everywhere from ski resorts to lively cities along the way. As Jake, a pup with a nose for adventure, you must solve a sinister dog-napping plot that involves the canine-hating Miss Peaches and Jake's pedigree friend, Daisy. Set in rural midwest US countryside, Dog's Life sees its hero embark on an epic journey that spans the US, taking in everything from ski resorts to vibrant cities along the way. Description: Jake's skin will appear increasingly distorted as areas within the game are explored. Workaround: Go to Config > Video (GS) > Plugin Settings, and switch to Software mode by setting Renderer to any of the "(Software)" options. Note: If you already played in Hardware mode during a session, any existing distortion will not get removed by switching to Software mode. Description: Some objects will appear blurred because of an off-set effect at a distance. Workaround: Go to Config > Video (GS) > Plugin Settings, click "Enable HW Hacks", go to Configure Hacks and enable the "Half-Pixel Offset" hack. Description: As of PCSX2 1.2.1 on the NTSC-U and NTSC-J version, Dog's Life will play the splash screen videos and check for save files, but immediately afterwards, VU locks up at 100% and freezes PCSX2. Workaround: Do not enable MTVU speedhack. This page was last edited on 26 September 2018, at 20:49.